Wild Vortex - monemades Webseite! 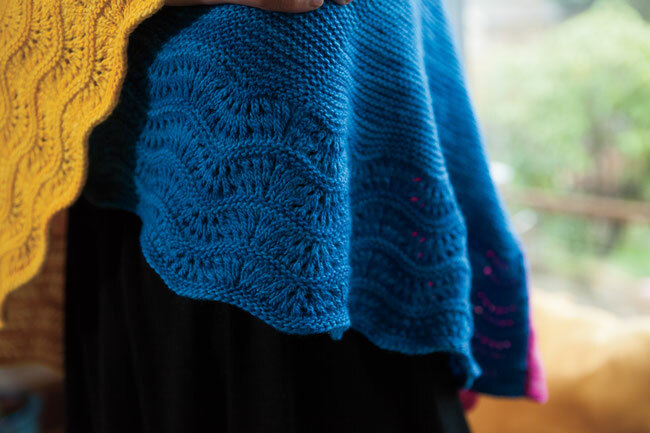 The generous sized shawl forms a three-quarter circle. The main part is worked in garter stitch, but to emphasize the idea of a vortex even futher, the bottom border is a feather and fan lace pattern, which forms a wavy edge. It could be worked in one colour, but also in up to six colours, one for each of the wedges. So why not pick your favourite colours and create your very own Wild Vortex version? The pattern is available from the Knit Picks website as part of the Everyday Wraps collection and also for indidvidual download, Wild Vortex.